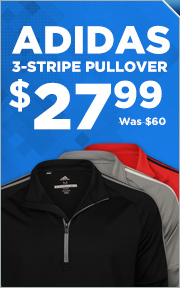 Adidas golf apparel pieces are packed with performance to help you play your best on the course. There is a wide range of colors and patterns to fit any style. The Ultimate shirts and pants wick moistrure away from your body, keeping you cool and dry on the course. A stretch waistband in the Ultimate pants and shorts flexes while you swing, adding comfor to their stylish looks. From the traditional solid-colored polo shirts and classic khaki pants to bright colors and patterns, Adidas golf apparel has something for you.